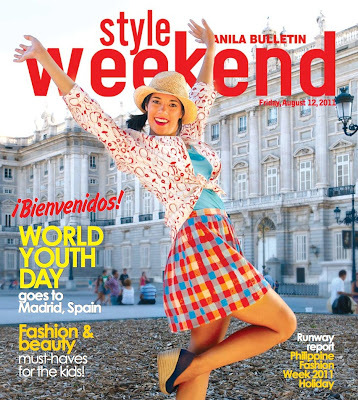 pls buy manila bulletin today (aug 12) for your free copy of style weekend! on the cover: celebrate world youth day aug 16-21 in madrid, spain! model nicole cocolas (wearing the event theme colors red, orange, yellow) photographed in front of palacio real by peps naval, my brother-in-law! styling by lara ilarde naval, my sister! printed top by oleg cassini. also in this issue: fashion & beauty must-haves for your little fashionista, chinese fine-dining, mon-sun style of blogger/designer camille co, PFW holiday 2011 top trends, and a super-expensive baby stroller!